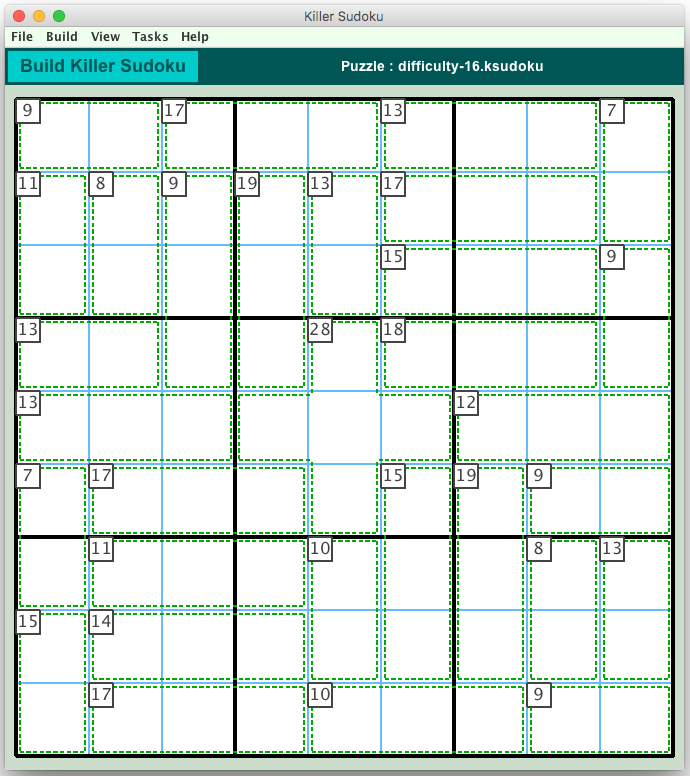 KILLER SUDOKU puzzles have much in common with standard SUDOKU puzzles. They are solved by placing numbers into the puzzles in such a way that every row, column and 3X3 box contains each of the numbers 1 thru 9. However, there are no prefilled cells in the puzzle to get you started. Instead, the cells of the puzzle are collected into groups called cages having random shapes and sizes. Each cage includes a one or two digit score which is the sum of all the solution digits for the cells within the cage. Many innovative techniques are available to use this information to complete the solution. 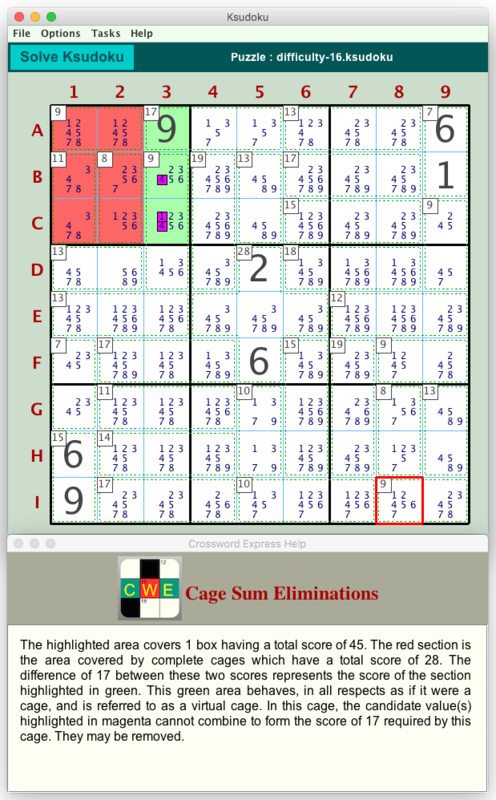 The following graphic shows a KILLER SUDOKU puzzle as it appears in the Crossword Express build screen. The cages are defined by the broken green outlines, and the cage scores appear in the top left corner of the cages. Fully automatic construction of puzzles at any of 18 different difficulty settings ranging from trivial to VERY hard. Fully manual construction is also available. This allows puzzles found in the printed media to be entered into Crossword Express . If you are new to KILLER SUDOKU puzzles, you can quickly learn the relevant solving techniques by using the Tasks / Request a Hint menu option of the Solve screen. This will result in the appearance of some colored graphics within the displayed puzzle which will indicate the location of the next step in the solution of the puzzle. Additional guidance is provided by means of a small help screen which also appears. The following graphic shows a typical example of the Help you can expect to see.